"How do I hold all this stuff?"! Professionals and Hobbyists love this EMF device. 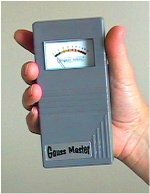 True-RMS, 3-Axis AC Gaussmeter with all the features you could want for your paranormal research needs - at a great, low price! A real technological breakthrough. Alkaline battery (included) typically lasts ~15 hours at default backlight setting. Suitable for general purpose magnetic field readings, and great for paranormal work! Lowest price for a 3 axis digital gaussmeter! 1 year wty. Made in USA. 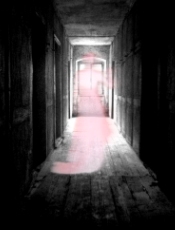 In paranormal research, the presence of man-made 50 or 60 Hz EMF signals can give rise to "false" readings. Wouldn't it be great if you could set your EMF meter to ignore these ever-present signals and just pick up everything else? Now you can! With this meter you can look at just the 50/60 Hz signal, or just the harmonics, or just everything else. And you can compare that reading to the overall reading on the same screen at the same time! Adjustable back light too, because it was designed with ghost hunting in mind. With the push of a button, this simple and accurate gaussmeter measures the level of magnetic field emitted by all 'unknown sources', common electrical appliances and equipment. An easy to read 10 LED light bar scale gives readings from 1.3 to 30 mG in small increments. The ElectroSensor has a detection range of 50-60 Hz with an accuracy of ±3dB. A pickup coil in the tip of the unit can be rotated for increased directionality. EMFs easily found. If you are looking for a low cost, user-friendly meter, here it is! AAA battery included. 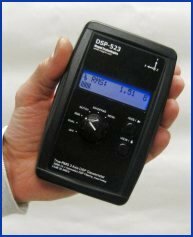 We like this meter as an alternative to the K-2 (K-II) meter - it's smaller and it costs much less! This little EMF meter's easy to read gauge, unique built-in audio signal and auto shut-off make it simple to use and a great way to find magnetic fields. Hand-held, light-weight and durable, with two easy to read scales (0-1 mG, & 0-10 mG), and dramatic audio signal. 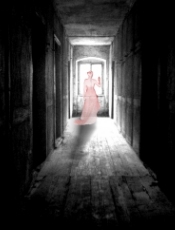 Our favorite meter for demonstrating the presence of paranormal activity to others. Uses a 9V battery (not included). Also goes by the name "Dr. Gauss". 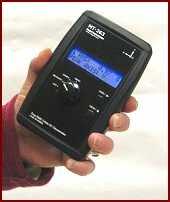 EMF Meter, Microwave & Temperature all in one instrument! Versatile new meter for detecting cell phone radiation, power line EMF, as well as paranormal research. Combines AC magnetic field detection, microwave sensor, and temperature in a very compact design. Easy to read LED indication and dramatic sound. External temperature probe on 6 foot cable, sold separately. Power: 9V battery (not included) good for continuous use for more than 30 hours. Couldn't be easier to use, just turn it on and get accurate reliable EMF readings while conducting your paranormal research. Perfect for situations needing high resolution measurements of AC magnetic fields without spending a lot of money. Large LCD display reads 0.1 -199.9 mG over the ELF range of 30 - 300 Hz. Calibrated to within 4% ± 3 digits at 50/60 Hz. This single axis meter samples every 0.4 seconds when flipped on with slide switch. Requires one 9V battery. One year limited warrantee. We are really excited about this new meter designed to provide quick, reliable and easy measurements of electromagnetic field radiation levels for your paranormal research. Displays 3-axis microTesla or milliGauss readout with date/time and offers Data Hold & MAX/MIN Hold functions. Extremely sensitive with range all the way up to 1999 mG.
Want more? Data-logging capacity with time/date stamp for field use and USB interface, Mac and Windows 98/2000/XP software and cable included. Large, easy to see display and rugged meter body. Uses one 9V battery. Great price too! You simply won't find anything this sensitive in this price range! Want to measure the Earth's magnetic field with great precision? Want to detect magnets from a distance? Subtle changes in static magnetic fields? Then this is the unit for you. Only 3" x 4" x 7" and operating on common 9V batteries for total portability and convenience plus AC power adapter included for extended benchtop use. An axial probe (High Sensitivity Hall Generator) with coiled cable is included providing nearly linear response from DC to 60 Hz. Large 3½ digit bipolar display. 4 ranges: 0-2, 20, 200, 2000 mG (yes milliGauss!) and a 5% error guarantee. One year parts and labor warrantee. 200mV DC recorder output included to interface this unit with your PC or recorder. What this EMF meter lacks in resolution it makes up with ease of use and very low cost. 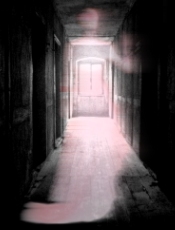 A favorite among beginner ghosthunters and those on a tight budget. Three LED lights which are easy to see in the dark indicate field strength. Single axis sensor, on/off toggle switch. One fresh 9V battery required.